Getting married is a serious preposition and requires careful thinking about a host of things. 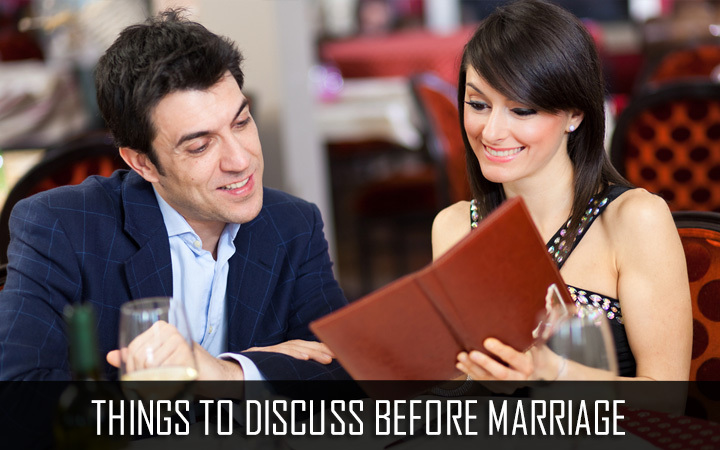 It is important that after your engagement that you sit down and discuss these with your fiance. From talking about career, finance, religion and family, future goals and plans, you both need to be on the same page to have a loving marriage. There are a lot of things that you’ll need to do together and it calls for compromise from both the partners. Other things to discuss before marriage are about your career. As a wife and mother, would you continue with your career or plan to stay home later? You need to discuss about having children in the future, extended family which includes whether the in-laws would be part of the family home or will you stay nearby or are they in another country. If you both come from diverse backgrounds and different religions, you may need to talk about the religion that you children would follow in the future. It may seem trivial now, but it would hold significance when you get married and adjust to a whole new lifestyle and culture. Whether it is about going to the church or following Ramadan, you need to be clear about the moral and values that you intend inculcating in your children. Additionally, knowing about these details will help you know about your potential partner’s views too. Maybe you have not talked about money and religion before so add it to the things to discuss before marriage. From deciding the household chores to whether you will or will not have alcohol in the house when you entertain, need to be clarified soon as these are some of the issues that become the bane in a marriage, causing friction and rift.